The best way to teach young children about family money management is to let them have some. Since most of us have to work for our money, it is a good idea to give them chores to do by which they can earn money. These should be different from the chores they must do as part of the family. You have to do chores that you don't get paid for and so should they. Just as you would prefer to do a job that you like, so they should get to choose what they would like to do to earn their own money. Of course it will still be a chore around the home if they are very small, but as they get older and are more responsible they can accept paying jobs from others, such as babysitting, raking leaves and walking the neighbors dog, to mention just a few. Make sure they choose something they can do quite easily, or they will tire of it quickly. They need to be praised for it too. Once they have agreed what job they will do, show them how to keep an account of their income in a simple exercise book. They should have a money box or purse to keep their money in and should also have the pleasure of spending it on something, after they have saved it up. They will love to get their money out and count it. If they are really young they will probably even want to play with it. Let them do this until they get used to having their own money, but encourage them to always put it away in a safe place when they've finished. After they have done their chore, be sure to pay them promptly. This will give them greater satisfaction than if they have to wait for payment. Older children can save up for some time before they spend their money on something they may want, like an ipod. Younger children may want to rush down to the mall and spend theirs the moment they receive it. Try to accommodate this desire at least at first. As they get older they will learn to wait a little longer to save for something 'bigger'. After all, isn't that what family money management planning is all about? Watering plants or the garden. Vacuuming one room or the whole house, depending on their age. Baking cakes or biscuits for the family. Cooking dinner one night a week. Dusting the ornaments once a week. When young children first start doing a paid chore, they may need prompting to do it. If they then don't keep on doing without being told over and over, you should just let it go. They will soon realize that they are not getting any money to spend. If they are happy about this, then perhaps they are getting too much pocket money, or maybe they aren't ready for the responsibility yet. In that case, you can include them in the household economy by pointing out the prices of things in the supermarket and quiz them to see if they can work out what will be the best buy. This will help to make them aware of what things cost and that you must keep to a family budget. If family money management, budget planning and money management for children where part of the curriculum in schools today, we could possibly avoid the inevitability of becoming "Planet Debt". 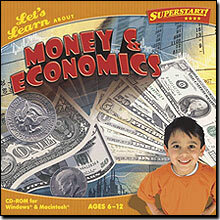 Kids will learn information about current and foreign exchange, shopping and budgeting, banking, job pay, history, and facts! There are three different levels, each packed with information. And the games and quizzes are specially designed with learning in mind. Mvelopes is a very user friendly online software for family money management. Check out the prices on Quicken 2008 Software - plus, save big on Microsoft Money 2008 & more! How To Avoid A Christmas Loan! The world has not yet learned the riches of frugality. To achieve financial freedom, ideas such as: listening to good advice, learning how to make a budget, understanding credit repair possibilities, avoiding the scams, and generally becoming more knowledgeable of the credit card business, can all play a role in eliminating credit card and other debt. There is A smarter way to manage your money .